Automotive glazing essentially involves the setting up of windows in vehicles. Polycarbonates have better material properties than that of glass, so upon the usage of the former instead of glass for automotive glazing will provide better thermal stability to the vehicle. 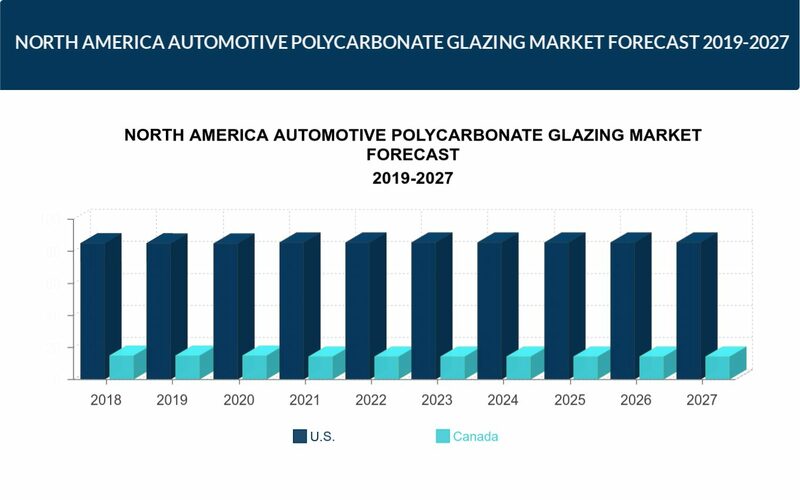 The North American market for automotive polycarbonate glazing will be developing at 14.16% CAGR during the forecasting years of 2019-2027. North America Automotive Polycarbonate Glazing Market by Vehicle Type (Passenger Vehicle, Commercial Vehicle) by Application (Side Window, Front Windshield, Sunroof, Rear Windshield, Large Windshield, Hydrophobic Glazing, Head-up Display, Switchable Glazing) by Geography. Automotive glazing essentially involves the setting up of windows in vehicles. Polycarbonates have better material properties than that of glass, so upon the usage of the former instead of glass for automotive glazing will provide better thermal stability to the vehicle. Also, polycarbonates substantially less than glass which can help in increasing fuel efficiency of the vehicle and reduce emission. Polycarbonate glazing is expected to be an opportunistic market for automotive sector owing to advancement in automotive designs, and the complicated designs can be implemented with the help of the polycarbonate materials only. Hence, advancement in automotive designs leads to a more viable adoption of the polycarbonate glazing services, especially in a region like North America where the automotive industry is progressing at a phenomenal pace. Thus, it is estimated that the North American market for automotive polycarbonate glazing will be developing at 14.16% CAGR during the forecasting years of 2019-2027. The countries considered in the North America region are the U.S. and Canada. The North American automotive polycarbonate glazing market is expected to be on surging trend owing to ongoing strict carbon emission regulations, demand for electric vehicles and demand for lightweight glazing materials along with the rise in automotive sales. Geopolitical turmoil is a serious challenge in the automotive sector as non-uniform government regulations for auto safety glasses is a point of concern that increases the cost burden on automotive industries, which in turn can affect the growth of the automotive polycarbonate glazing market. Engel Austria GmbH, Chi Mei Corporation, Idemitsu Kosan Co., Ltd., Covestro AG, Mitsubishi Chemical Corporation, KRD Sicherheitstechnik GmbH, Sumitomo Chemical Co. Ltd., Renias Co., Ltd., Sabic, Webasto SE, Teijin Ltd. and Trinseo S.A. are the major companies operating in the regional market for North America.